The Havasupai Tribal Council is inviting Native American neighbors and the general public to gather at Red Butte for four days this fall, October 4-7, 2018, for an intertribal spiritual gathering to protect their Grand Canyon homeland from uranium mining contamination. Why gather at Red Butte? For first-time participants, these periodic gatherings near the southern gateway to Grand Canyon National Park offer a crash course in listening and learning. Last year’s gathering at Red Butte occurred during the heat of summer. Convened in a sagebrush meadow within a high-plateau forest of piñon pines and juniper, we awoke early each day to the smell woodsmoke, chilly temperatures, and starlit skies. As the shadow of nearby Red Butte retreated with the rising sun, drumbeats, and singing filled the air. The gatherings at Red Butte also serve to send messages to a larger audience and to unite opposition to such ongoing threats as the nearby Canyon uranium mine and the possibility of new mines adding to the legacy of contaminated air, water, and land that surrounds the Grand Canyon. But possibly the most compelling reasons for attending are to experience what occurs as the guardians of Grand Canyon gather on sacred ground and to support their cause. In 1882, 10 years after Congress passed the law that opened public lands to mining, the United States officially restricted the Havasupai to a 518-acre reservation. But many tribal members continued to use their lands above and below the canyon’s rim until copper miners pushed them away from springs where they gardened every summer. Later, federal agencies took possession of Red Butte, Indian Gardens, Rain Tank, and many other sites where the Havasupai once lived and gathered. For nearly a century, the Havasupai fought to regain access to hunting grounds and sacred areas above the rim. Finally, in 1975, Congress returned a portion of those lands for traditional uses. 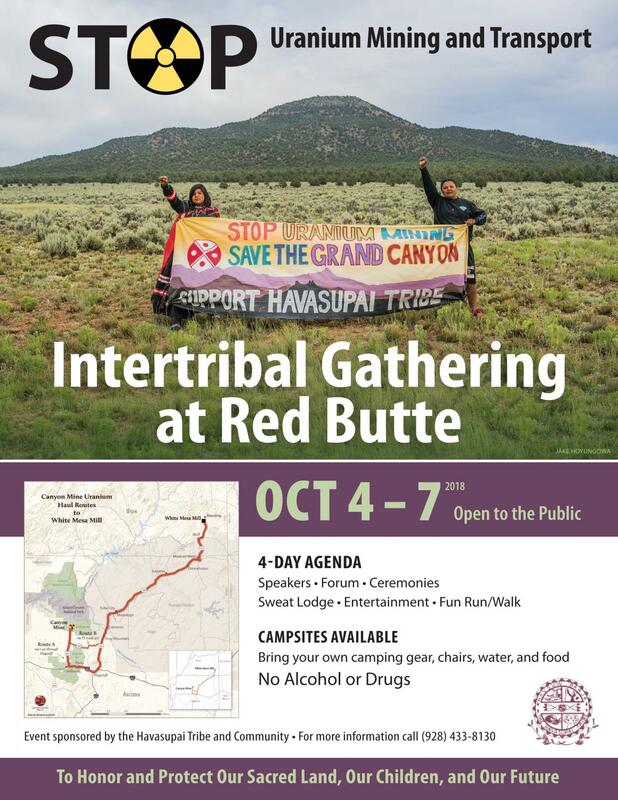 Still, the Havasupai must ask permission to gather at Red Butte. The Havasupai refer to Red Butte as “Clenched-fist Mountain” and “lungs of Mother Earth.” It is the spiritual center of their aboriginal homeland encompassing more than 3 million acres. The prominent stack of maroon-colored rocks is visible to millions of visitors as they approach Grand Canyon National Park. During the 1980s, the U.S. Forest Service permitted a mining company to begin developing the Canyon uranium mine, located within what was later recognized as the Red Butte Traditional Cultural Property. The Havasupai lost their first lawsuit to stop the mine. But the partially developed mine soon closed in 1991 due to what turned out to be a decades-long slump in uranium prices. The Havasupai again sued the U.S. Forest Service when it permitted Canyon Mine to reopen in 2013. Their appeal of that suit was still pending last year, when they asked the agency to permit the 2017 gathering at Red Butte. The Kaibab National Forest had banned all campfires due to seasonally dry and windy weather and dangerous wildfire conditions. Respecting their request, the agency made an exception by permitting the Havasupai Tribe to build three fires. Each morning before dawn, singers and drummers gathered at the ceremonial fire. Across the meadow, another fire boiled water next to a steam-healing sweat lodge. Later in the day, cooks tended a larger fire in a roasting pit to help feed several hundred people. On the fourth day, a soaking rain swept across Red Butte. The dates for this year’s gathering were selected to coincide with the four days preceding Indigenous Peoples’ Day. Hosted by the Havasupai Tribal Council and community, the Grand Canyon Trust, National Parks and Conservation Association, Sierra Club, Center for Biological Diversity, and a private citizen are helping to cosponsor the gathering. The U.S. Forest Service is donating water. This year, there are no fire restrictions in effect.